Press "Play" to watch the 2011 Show! Click here to watch the 2010 show! GPB is partnering with Georgia Tech to bring you a reality competition show you're not soon to forget. 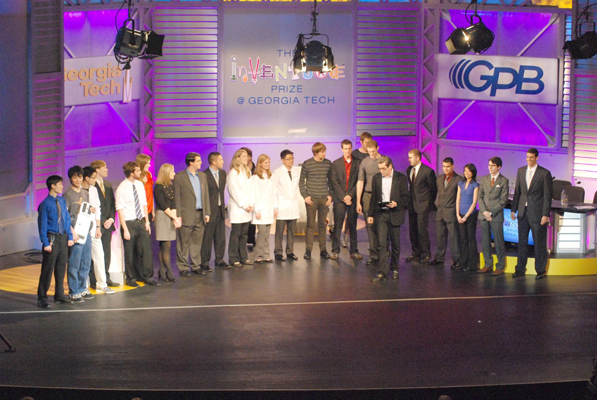 Georgia Tech whiz kids have teamed up to compete for a cash purse and a US Patent. Created and organized by faculty of Georgia Tech, the objective of The InVenture Prize is to create incentives, resources, and a structure for undergraduate student innovation and entrepreneurship in a fun, high-profile event. 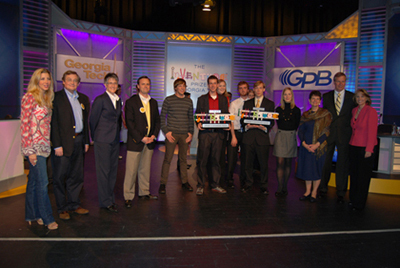 Tune in to GPB TV on March 9 at 7:00 PM to see the 7 finalists demonstrate and defend their innovations in front of a panel of expert judges. Entrepreneur of the Year Award Winner 2002 and Georgia's Woman of the Year 2005 Award Recipient, as well as the Founder of Spanx, Sara Blakely will be one of the judges this year. Former CNN anchor and NASA expert Miles O'Brien will co-host with student mentor and Georgia Tech grad Dr. Bahareh Azzizi. First Place Prize: a cash prize of $15,000, a free US patent filing by Georgia Tech's Office of Technology Licensing (valued at approximately $20,000) and business services to pursue commercialization, such as funding opportunities, office space, market vetting and mentorship by faculty and industry entrepreneurs. Second Place Prize: a cash prize of $10,000 (sponsored by the ACC Intercollegiate Academic Collaborative), a free US patent filing by Georgia Tech's Office of Technology Licensing (valued at approximately $20,000) and business services to pursue commercialization, such as funding opportunities, office space, market vetting and mentorship by faculty and industry entrepreneurs. The People's Choice Award: a cash prize of $5,000 (provided by the NCR Corporation). The live audience and broadcast viewers will have the opportunity to help select the winner of this award by voting on the internet or by text message. Congratulations To This Year's Winners of InVenture! Miles O'Brien is an award-winning 27-year broadcast news veteran specializing in aviation, space, science, the environment and technology. He worked as a correspondent, anchor and producer on CNN's "Science and Technology Week," "Talkback Live," "Headline News Primetime" and "CNN American Morning." Recently named to the NASA Advisory Council, O'Brien currently owns a production company in New York City that creates, produces and distributes original content across all media platforms. Bahareh Azizi earned a B.S. Degree in Biochemistry/Biotechnology in 1999 from Michigan State University and then moved to Atlanta to pursue a doctorate degree from the Georgia Institute of Technology in Biochemistry. 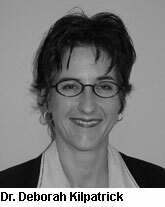 Since completing her Ph.D. in 2005, Azizi has worked at Georgia Tech and Oxford College of Emory University as an educator, researcher, and administrator. Her most recent focus has been in the field of protein engineering and nuclear receptors. 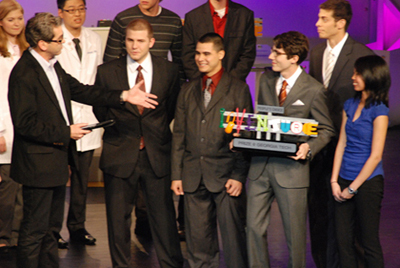 In 2007, Azizi hosted the PBS TV pilot show Science Investigators, which highlighted technological advances today. Sara Blakely, founder and owner of Atlanta-based SPANX, invented footless pantyhose after researching trademarks and patents at the Georgia Tech Library. Since 1998, she has created more than 200 problem-solving products. Blakely has been named Ernst & Young's Entrepreneur of the Year and Georgia's "Woman of the Year." Deborah Kilpatrick is senior vice president at California-based CardioDx, a privately held genomic medicine company focused on cardiovascular disease. 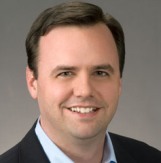 At Georgia Tech, Kilpatrick serves on several advisory boards and was named to the Council of Outstanding Young Alumni. She holds multiple U.S. patents and a Ph.D. in mechanical engineering from Georgia Tech. Greg Foster is founder and CEO of BrightWhistle, a marketing software company in Atlanta and an entrepreneur-in-residence with Chrysalis Ventures. Foster is a member of the Board of Trustees for the Georgia Tech Alumni Association, the Georgia Council on Economic Education and the Bobby Dodd Foundation. He holds a B.S. in mechanical engineering from Georgia Tech and an MBA from Harvard Business School. David Phelps has served as president and CEO of Kentucky-based CreoSalus, a peptide science company, since 2002. For more than 25 years, his career has included significant management roles with large life science (medical device, drug and bio-tech) companies. He has developed more than 50 medical devices and has more than 25 patents issued or pending.